In part one of this review / getting started guide for the Minoura Live Ride 340 magnetic trainer, I showed how to physically get it to the point of being ready to ride. With the bike itself ready, we turn to the big selling point: the Live Training software. You'll recall that the Minoura Live Ride trainers have neodymium magnets which basically means we know how much power is required to turn the unit. This means we can use the iPhone App(s) to have calibrated rides, or if your prefer, you can re-ride existing courses. Yes eventually I can tackle, virtually, Mont Ventoux. If you have these already, then great. If not, you have just approached a major fork in the cycling accessories road ie Bluetooth LE or ANT+ ? I'll address this conundrum separately. In the meantime, I'll assume you are going with ANT+, since most folks who ride for real and have a Garmin GPS unit eg Edge 500, 800 etc, will already have ANT+ since that what they use. The Minoura instructions say that nearly all ANT+ sensors other than Garmin will work. 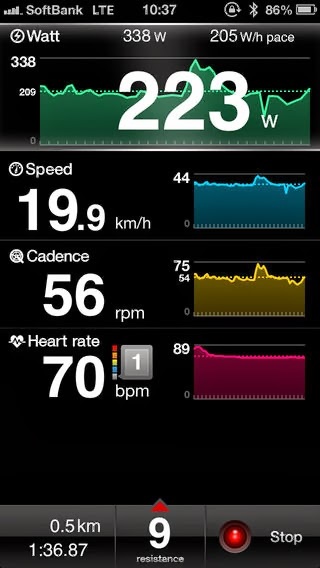 Actually I found the Garmin HRM and GSC-10 worked fine. YMMV of course. So this will cost about $250 to do in ANT+. When you plug the iPhone into the case, its all plug and play: nothing to install. Next suggest you install the Wahoo iPhone app. Its free and allows you to connect the sensors and confirm all is working OK.
Then start the Live Training App. Touch "Settings" and work your way through each field. Here's a screenshot (not mine... I don't get SoftBank LTE in Sydney :-) ). The "9" at the bottom in the middle is the resistance. For general rides you set it to be whats on the Live Ride trainers remote control. For riding a "Course" you set the remote to what it says on the iPhone's screen. If all is good, move to Part 3 to see how to ride your first Live Ride Course.